This is a strong chocolate martini. It makes 3-4 drinks. You can thin it out with more soy milk or ice. By "shot glasses" I mean the small glass shot glasses that are sold as a pack of 4. Each= 3 Tbsp/ 1.5 oz at the brim. Blend in a blender on High and serve. 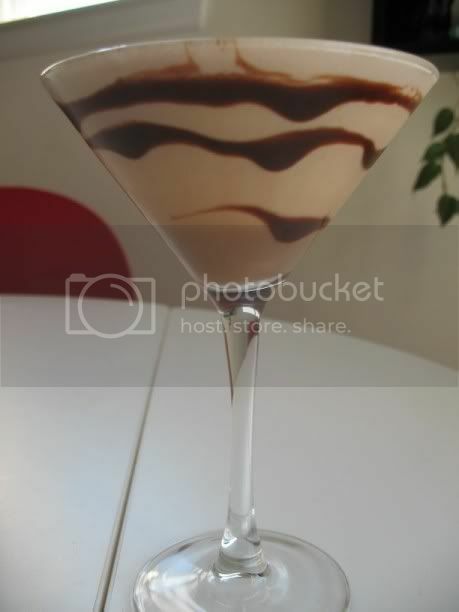 For service as shown, hold a martini glass and rotate while gently squeezing chocolate syrup so it comes out in a thin line. You can also put syrup in a saucer, then dip the rim of the glass in the syrup then in cocoa powder for maximum chocolate flavor. Don't go crazy. PLEASE get a designated driver if you drink! I don't want you hurting anyone. This is for people who are of legal drinking age. oh pamela! that is one of the best things i've seen all day! I need to get some vodka. I just have some weird apple flavored one that I can't use in anything because it's gross.